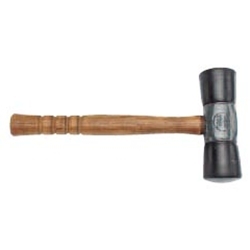 Heavy Duty Tire Hammer Wood Handled Ken Tool T34 / BOWES KT T34. Hammers are used for mounting and demounting tires. They make tire changing faster and easier for passenger car, truck, bus, farm tractor, and aircraft tires. A variety of weights and sizes are offered to meet all your tire changing needs. Non-marring rubber end can be used for driving on lock rings.